This is Coldplay in 2017, saying "hi" to the mainstream by pandering to pop, and actually managing to do a not-half-bad job of it. It 's hard to convey with words just what a relief Kaleidoscope EP's first track is. It is called "All I Can Think About Is You", and the importance of its presence in the modern-day Coldplay canon cannot be overstated. It's a big song, not far from the slow-burn sentimental-epic word that was so common among Coldplay's first few albums. If you think "Trouble", or "The Scientist", or "Fix You", you're in the neighborhood. That said, you throw a dash of Ghost Stories into that mix, and you end up with something exquisite. Most of Ghost Stories eschewed most of the pomp and melodrama of typical Coldplay balladry in favor of something more grounded, and that's how "All I Can Think About Is You" starts, with a very straightforward and steady guitar-bass-drums groove. Granted, that quiet groove doesn't last all that long, but the slow build that the song takes into bombast actually feels earned, as elements slowly layer on top of each other until the whole song is a swirl of instruments and Chris Martin's simple, pleading vocal. 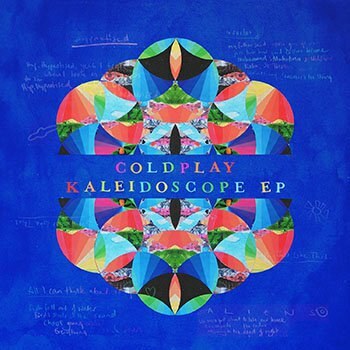 This is a sound that we haven't heard from Coldplay in a long time, maybe as far back as 2005's X&Y, and it is a sound so welcoming and warm that it's easy to forget why the release of Kaleidoscope EP inspired such trepidation in the first place: That is, a cool 40% of it was already known to be pretty awful. Actually, "pretty awful" might be a little strong for Chris Martin's collaboration with the Chainsmokers; it is admittedly kind of catchy. It is also utterly disposable in the way that the Chainsmokers clearly aspire to, its lyrics an ode to the hookup out of the mouth of a man who is 40 years old, as told through the recitation of a list of famous stories and characters. It is as banal as it is inescapable, the type of song you'll sing along to while hating yourself for singing along. The version here is the misleadingly-titled "Tokyo Remix", a live version that makes the song sound muddier and adds a whole bunch of audience sing-a-long vocals, but is otherwise identical to the original. The other track we knew about well in advance is "Hypnotized", which has been around since March. Everything that "All I Can Think About Is You" does right, "Hypnotized" does wrong. It's a slab of slow, meaningless treacle that sticks around for an unwieldy six-and-a-half minutes. Where "All I Can Think About Is You" used a minimal set of lyrics to put the focus on the instrumentation, "Hypnotized" can't stop talking without actually saying anything. The two songs that are left are fine-if-forgettable bits of non-album detritus. "Miracles (Someone Special)" is another song that tells its story through a list, this time a list of heroes that Chris Martin's dad (apparently) told him about long ago, complete with a dropped-in guest verse from Big Sean that might not set the world on fire, but isn't nearly as bad or awkward as it could have been. This is Coldplay in 2017, saying "hi" to the mainstream by pandering to pop, and actually managing to do a not-half-bad job of it. "A L I E N S" is a collaboration with Brian Eno that can't quite find a groove in its 5/4 time signature, but whose subject matter -- the struggle of refugees -- is worthwhile. "A L I E N S" is Coldplay as a critical darling, a laudable attempt at artistry out of place on an EP filled with all manner of straightforward ear candy. It seems worth mentioning, however, that proceeds from "A L I E N S" go toward the Migrant Offshore Aid Station, an organization that assists refugees on the Mediterranean. Their heart is in the right place. Kaleidoscope EP is one of those EPs with no mission statement, a collection of oddities that never would have fit on the unfailingly upbeat (if shallow) A Head Full of Dreams. There's no story to be told, just a small collection of tunes, some of which work beautifully, some of which fall utterly flat. It's been a year and a half since A Head Full of Dreams, and if you're dying for new Coldplay, this will scratch the itch. Even if you're not, though, there are one or two songs here that are absolutely worth your time.